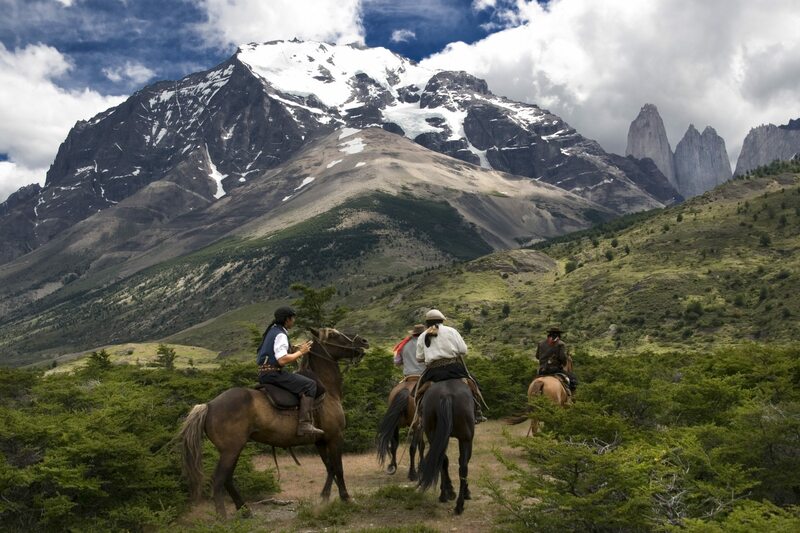 Horseback riding is one of the best ways to see the rugged and beautiful countryside of Chile. You’re following in the hoofprints of the Chilean Huaso (cowboy) tradition, experiencing nature with all of your senses. There are so many gorgeous places to ride horses in Chile, but here are a few of the most stunning opportunities to saddle up and hit the trail. Mother Nature sometimes likes to show off what she is capable of and Torres Del Paine is a great example of this. The Torres del Paine, the mountains that give the park it’s name, are three distinctive peaks of granite piercing the sky. Enormous glaciers, towering rocky peaks, glittering lakes and thundering rivers fill every visitor with awe. The terrain is perfect for long galloping rides and you can either stay in an estancia (a ranch house) or camp on a multi-day ride. You will be able to ride up to the glaciers, explore the foothills and skirt along the wetlands against the spectacular backdrop of the Paine Massif. The wild and barren landscapes of Patagonia, with their snow capped mountains and enormous skies, are the perfect place for a horseback riding adventure. UNESCO has named this area as a World Biosphere Reserve and it is home to some of the most spectacular scenery in the world. The wind can blow hard and the weather conditions can be extreme, so listen to the advice of your local guide for a safe and enjoyable ride. The horseback journeys in Patagonia will generally take the low trails through the valleys in order to avoid the heavy winds. 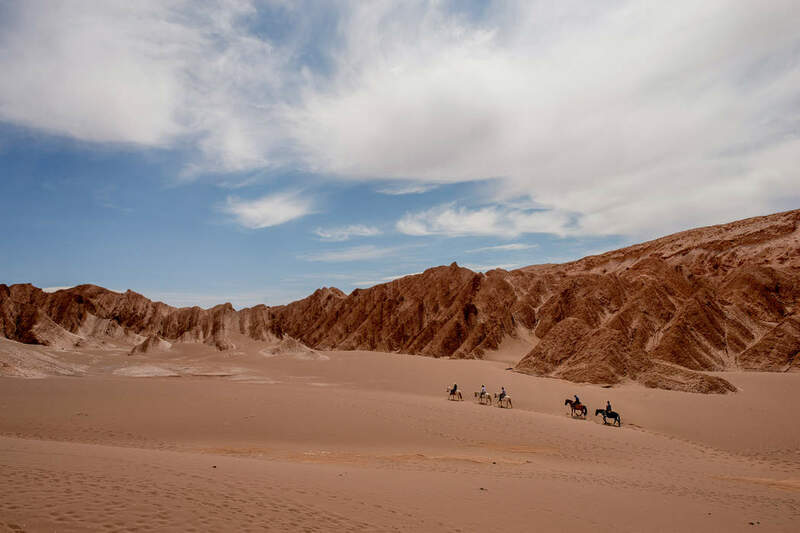 For a truly epic horseback journey, you can cross the Andes on a trail that San Martin and his “Army of the Andes” used in 1817 as they freed the people of Chile from the European monarchs. You’ll journey through the steep mountain pass, flanked by the towering stone peaks of Mercedario and Aconcagua. During the journey you will have lots of time to stop in local villages along the way and explore. You’ll have the option of ending up in Mendoza, Argentina where you can relax and sample one of the world-renowned wines that are produced here – you’ve earned it. The Atacama is a huge expanse of stony terrain dotted with salt lakes and felsic lava flowing towards the Andes. It is situated between two mountain chains that create a rain shadow on either side, making it the driest non-polar desert in the world. There are some weather stations here that have never received rain and sometimes the region goes for years without a drop. Exploring this ancient, arid desert on horseback is like no other travel experience in the world. As you ride past the rusty ravines, vast white salt flats and coloured lakes, you will feel like you are on the surface of another planet. The small town of San Pedro de Atacama is the ideal base for beginning your journey. Be sure to head to the Valle de la Luna, which has a moon-like landscape and looks surreal and hypnotic when illuminated by the golden glow of the setting sun. Most horseback riding tours will begin in San Pedro and travel along the Vilama River to the Valley of Arenoso, the Devil’s Throat and Coca Stone. 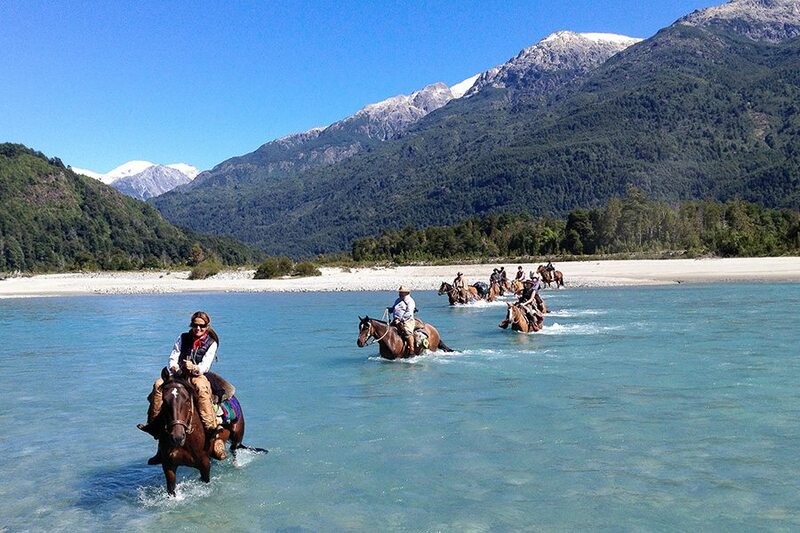 To create your perfect horseback riding adventure in Chile, check out our Design your Tour feature so that you can put together a custom tour.